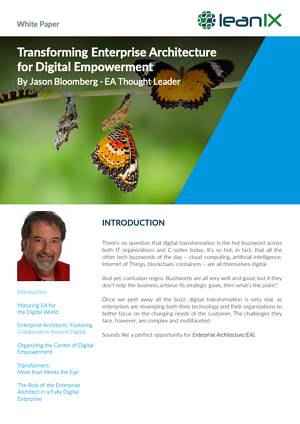 Digital transformation is the hot buzzword across both IT organizations and C-suites today. It’s so hot, in fact, that all the other tech buzzwords of the day – cloud computing, artificial intelligence, Internet of Things, blockchain, containers – are all themselves digital. And yet, confusion reigns. Buzzwords are all very well and good, but if they don’t help the business achieve its strategic goals, then what’s the point? Once we peel away all the buzz, digital transformation is very real, as enterprises are revamping both their technology and their organizations to better focus on the changing needs of the customer. The challenges they face, however, are complex and multifaceted. Sounds like a perfect opportunity for Enterprise Architecture (EA).